Symphony of the Seas, currently the largest cruise ship in the world, has 13,347 pieces of art aboard. Take a look at the nine coolest (below). Video courtesy of Royal Caribbean International. All rights reserved. May not be copied or used without permission. Carnival's Costa brand has renewed for three years its three-way partnerships between the cruise line, the Singapore Tourism board (to leverage the city's cruise hub) and the Changi Airport (to leverage the city's large air travel hub) and further enhance the city's appeal as a destination and port of embarkation. The agreement is expected to bring more than 100,000 fly/cruise passengers to Singapore over the next three years. Details appeared in the October 4 issue of Cruise News Daily. Your vacation memories could help decorate Sky Princess for years to come and be seen by thousands of other Princess cruisers. In the process, you could win yourself a cruise for two on the new mega-liner. There will be a thousand winners in this contest who have their photos printed and framed and displayed in the stateroom corridors aboard Sky Princess when it sails out of the yard next October, but only one of those will win the grand prize of a cruise for two up to a week long. 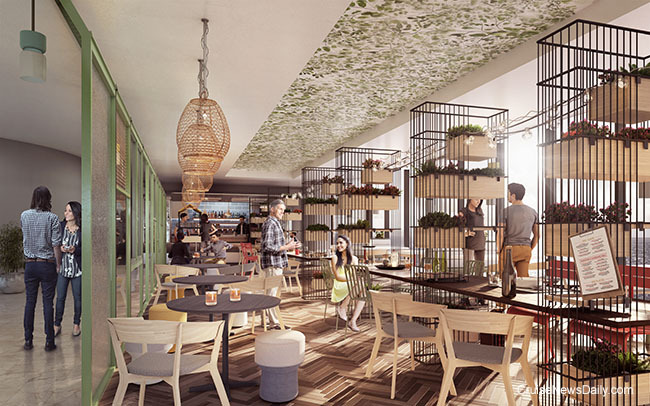 When Mein Schiff 2 is delivered to TUI next spring, it's going to have a new look in many areas. Two areas that will definitely have a different look and wow passengers are the Day & Night Bistro and the Schaubar ("Show Bar"). For Mein Schiff 2, award-winning German designer Werner Aisslinger has created new designs for both. The complete story appeared in the October 3 issue of Cruise News Daily. 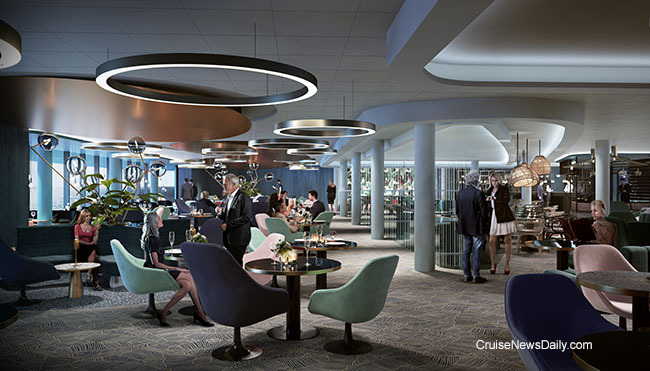 Renderings courtesy of TUI Cruises. All rights reserved. May not be copied or used without express permission. 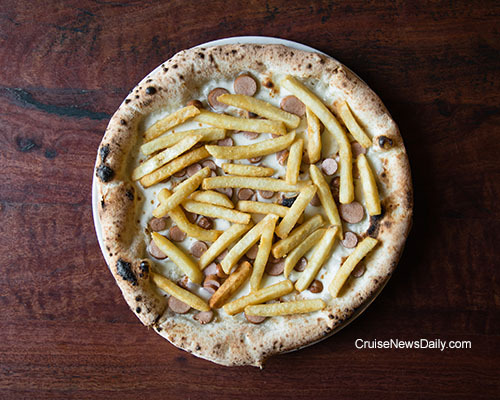 "Pizza Viennese" being served aboard Pacific Explorer. The 103,000-ton Costa Fortuna is returning to Europe next summer after several years of carrying the Costa flag in Asian markets. Before it returns, many areas of the ship will be restyled in a dry dock which will be completed in Singapore in December. Renderings courtesy of Costa Crociere. All rights reserved. Many not be copied or used without express permission. Details appeared in the October 2 issue of Cruise News Daily. How much do you know about closed-loop Exhaust Gas Cleaning Systems (EGCS). Well, if the first thought that popped into your mind wasn't “scrubber,” you are one of the people a new group is targeting. Well, you are if you are a leader of industry, national and international authorities, non-governmental organizations. If members of the public, like you and me, also get informed, that's ok too. The new group of 18 shipping industry giants, including Carnival Corp and their nine brands, has formed the Clean Shipping Alliance 2020 (CSA 2020) to inform their target audience about Exhaust Gas Cleaning Systems and their associated air and water emissions. The complete story appeared in the October 1 edition of Cruise News Daily. Grand Celebration has again been chartered for two months to house relief workers, this time in Massachusetts. The ship will be out of service for all of October and November. A woman was arrested for cutting and stabbing her boyfriend with a steakknife aboard Carnival Fantasy during an argument. 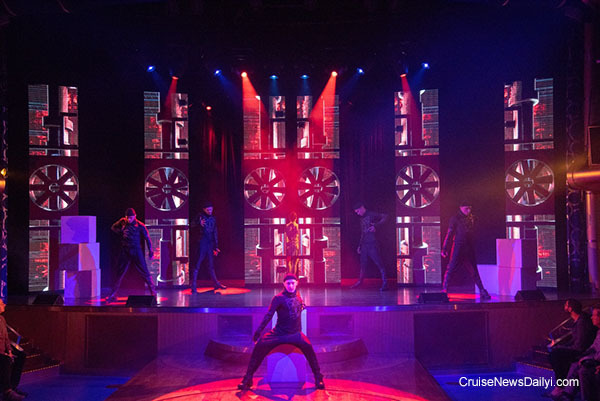 Details appeared in the October 1 issue of Cruise News Daily. 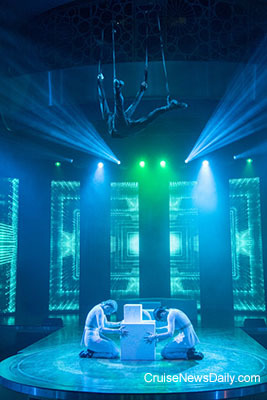 A scene from "Augenblick" aboard AIDAluna. Note the performer hanging above the state at the top of the picture. Photos courtesy of AIDA. All rights reserved. May not be copied or used without express permission.